Dressing your dog up in pet costumes is something that can happen for a lot of reasons. Christmas and Thanksgiving, when family and friends are around, are good times for this to happen. If your dog doesn’t like costumes there are still some fun accessories and things you can do to dress them up a bit. Scout has found some of the cutest turkey costumes for dogs. Of the many Thanksgiving costumes for dogs, Scout likes the KCouture Turkey Dog Costume on Etsy because it has so many fun parts to it and a lot of colors! Dressing your dog up on Christmas is a great way to encourage others to mingle with your pooch this holiday season. If you are doing any charity events then a turkey-themed costume is going to be different than what a lot of others are doing guaranteed! 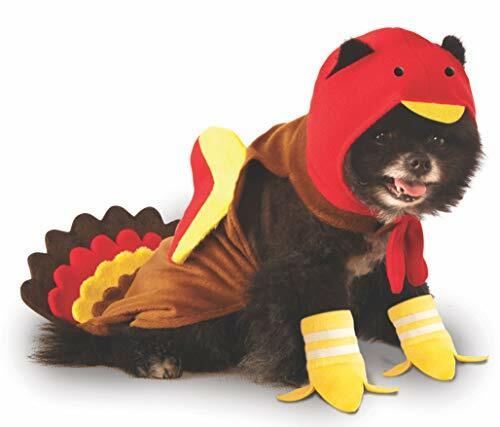 The Rubie’s Turkey Costume is one of the full body pet costumes we discovered that comes in sizes from Small to X-Large. The feet part of the costume may be a challenge to get even the most cooperative dogs to wear but the costume is still worth it. This pet costume is easy to put on and fully adjustable for the comfort of your dog. Complete with a stuffed beak and fun wings, this turkey costume is a real gobble…I mean, hoot. The whole thing fits similar to a t-shirt, so dogs that are used to wearing at least dog clothes once in a while should do well with this costume. As it’s one of the easier to manipulate thanksgiving costumes for dogs, it’s one of our favorites. 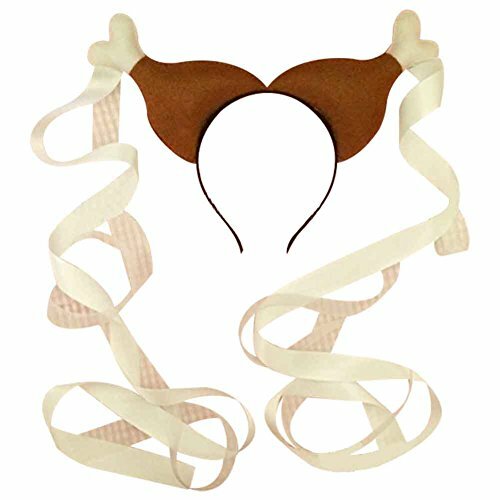 If you can’t get them into a turkey costume then maybe you should try out this turkey leg headband that is sure to get a lot of smiles. It does have ribbons that hang down but these can be easily removed or trimmed to fit your dog better or you could tie them in a bow! This headband is suitable for both cats and dogs, making it ideal for if you want your pets in matching pet costumes for the annual turkey trot. You could even make am adorable DIY version with some hot glue and some creativity. This Thanksgiving dog sweater or Christmas dog sweater is perfect for Thanksgiving dinner or any time you want to get a smile out of those that are around your pooch. T-shirts and sweaters are a great alternative to some of the heavier pet costumes on this list. If you live in a warm place, a dog may not be comfortable in much more than a t-shirt. 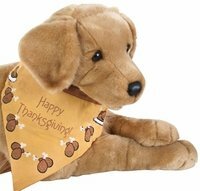 Team this up with the turkey drumstick headband on this list and you will have a really cute look for your dog. 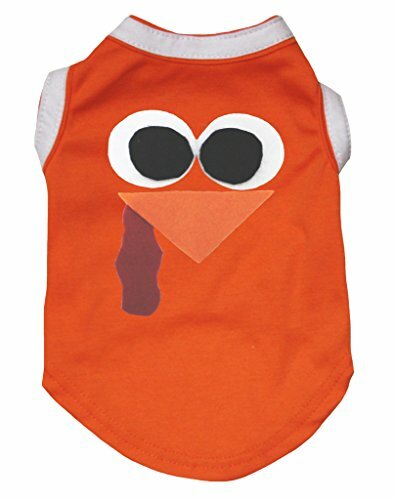 For the girl pups out there, check out this adorable turkey-themed dog dress. This perfect for a sassy little dog. It is lightweight enough to not get too hot on them under most conditions. A bow with rhinestones adds a finishing touch to this dress. 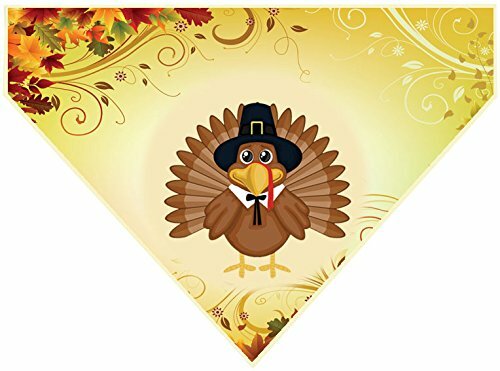 If you’re shopping for the holiday season, this bandanna can be attached to your dog with ease and helps them convey the Thanksgiving spirit. If your dog is hard to size or just likes to keep it basic then this is a very affordable yet cute option. Another Thanksgiving pick, this handmade costume combines felt and feathers for a really fun look. Scout loves the addition of the Pilgrim top hat to this costume. This is a major detail that helps it stand out. You can also glue felt and feathers onto a dog t-shirt to create your own costume if you prefer. 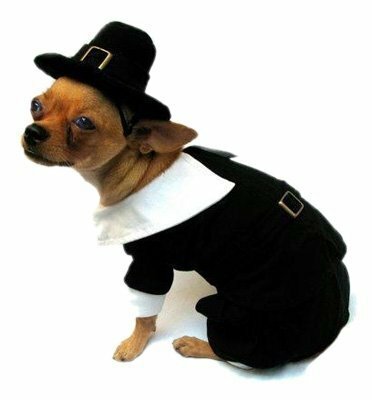 If a turkey costume is not for your dog then maybe you should consider an adorable Pilgrim outfit! This costume, complete with a hat, is made to last for more than a few Thanksgivings. You may want to consider using a Pilgrim costume for a second dog in the house if you dress one up like a turkey! 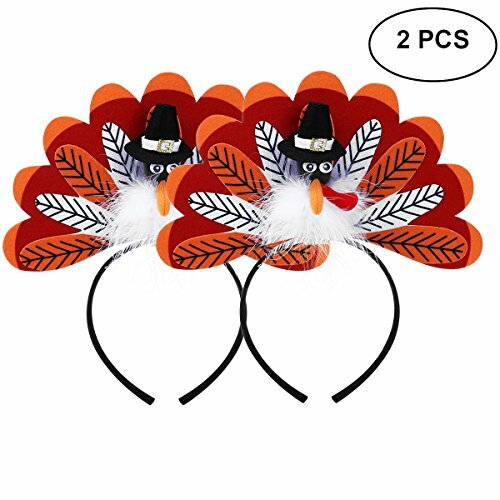 This adorable turkey headband two-pack is a fun way to celebrate and could be used to accessorize your dog. Unlike many pet costumes, this will also work on cats and dogs, and you if you so choose! This is the most well made and over the top turkey dog costume on this list. For those that want the ultimate costume for their dog, this custom costume is really adorable. A tutu and feathers combined with wings and a crochet style body all combine for a luxury turkey costume for your canine companion. 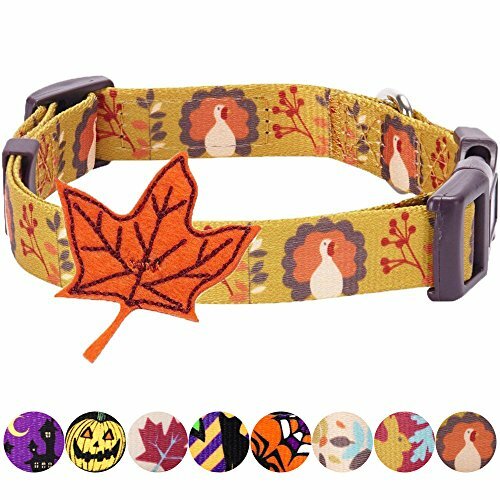 Here is a fun and adjustable turkey-themed dog collar from Blueberry Pet that will get everyone in the spirit. This sturdy collar will last for years. 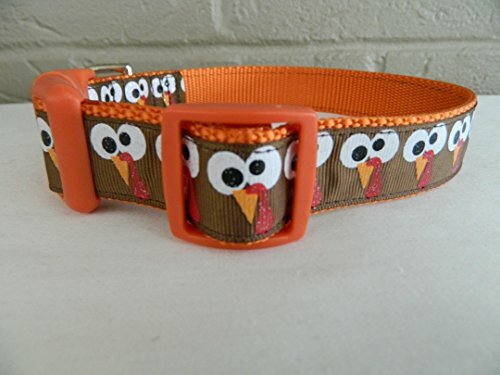 This adorable big eyed turkey collar is sure to make anyone smile. Sturdy nylon webbing means this collar is made to last and it is adjustable for a great fit. For a dog bandanna, this one is downright gorgeous. Bright graphics and a smiling turkey make this one stand out. This would be perfect for strutting around the dog park or for a therapy dog around the holiday season. If none of these Thanksgiving costumes for dogs jumped out, and you want to put your own turkey dog costume together, then you may want to get a dog tutu and hot glue some feathers on it. 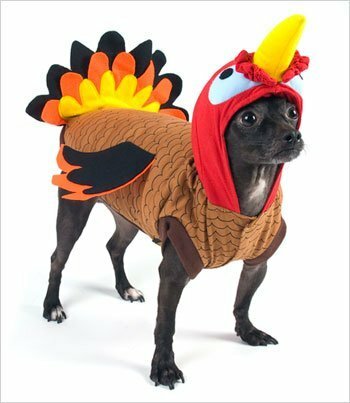 You can just put this on your dog and it will give a turkey like look without doing much else. You could combine this with a brown dog t-shirt for a more complete costume. Alternatively, look at using hot glue to adhere faux feathers to a white collar for a frilly, festive look. Just be mindful of getting in the way of your dog’s mouth. If your dog ingests the feathers and hot glue, it could cause gastrointestinal upset, such as vomiting and diarrhea. You don’t want to put the trots in the annual turkey trot, nor do you want it putting a damper on your Thanksgiving dinner (or dog clothes). If you’re worried, look for a machine washable option. While crocheting or knitting a Thanksgiving dog sweater or puppy costume for your dog takes some time, it may be an enjoyable project for you. This also allows for custom sizing if your dog doesn’t fit the pet costumes listed above. Some of the costumes Scout found for this list are handmade and take some time. If you are not sure that your dog won’t chew or try to destroy a costume then it is best to stick to some of the less expensive ones on the list. Accessories are always an adorable option, with many dogs not minding a scarf or something small like a tutu. If your dog has acted positively about wearing clothes in the past then you are lucky and have a lot of great options! One thing that Scout noticed is that a lot of turkey costumes for dogs often cover the ears. If you want your dog to be more comfortable wearing a costume for a parade, or any extended event, then you may want to consider a costume that is in several pieces so you can remove a headpiece or pull it back if it is starting to irritate them. There are a lot of dangling parts to a lot of these costumes which can make a dog think they have something on that they need to get off. If you want your dog to wear any of these costumes for Thanksgiving then you should order now and get them used to it. So you’re all ready. The bread dough is rising, you’ve prepared the mashed potatoes, green beans and cranberry sauce. The pumpkin pie is ready to go and Thanksgiving dinner is set. Scout has found and shown you a lot of inexpensive options for trying out a turkey costume or dressing your furbaby as a pilgrim girl. Now you can sit back, relax, and enjoy the holiday spirit.